Search for Lady Rachel Russell in CBW. Find Lady Rachel Russell on the Pop Chart. In the Pop Chart, sampling the unspecialized collections of women’s biographies in three periods, Lady Rachel Russell is one of the most prominent subjects in the category “role in revolution.” Whereas Madame de Staël and Madame Roland contend with male leaders and mobs during the French Revolution, Lady Rachel plays a role in the civil and religious conflicts in England. Many biographies of Lady Russell emphasize her talent as a writer, her piety, and her exemplary performance as wife. For Lydia Maria Child, Sarah Hale, Mrs. Newton Crosland, and other presenters, Lady Russell figures prominently in the cohort of patriotic wives, historic actors in national events with their husbands. The Oxford Dictionary of National Biography emphasizes her achievements in sustaining Whig political power after her husband's execution and the "bloodless" revolution that put William and Mary on the throne in 1688. Russell remained a prominent figure because her letters were published in 1773, Mary Berry edited her life and letters in 1819, and again John Martin produced an edition of her letters in 1854. These collections confirm the intricacies of political intrigue that led to her husband's death, but also her effective role in politics and her enviable social and family life in spite of many occasions for grief. Few women are to be compared with the wife of the unfortunate Lord William Russell; and we may safely hope that the evil times in which she lived will never again return to curse this fair England of ours. In her mournful history are seen those noble characteristics which are usually alone to be found depicted in the pages of romance. In her they were actual and real,—the strength, and beauty, and glory of her life; they shine forth in her power of self-denial, in the entire devotion to the memory of her murdered lord, in her study for the well-being of their children, no less than in the persistent goodness of heart, the sincere religiousness of conduct, resplendent alike in her happiness and in her sorrow, which, as the ages glide away, live and brighter grow: time can never dim them. How purely bright her story shines out amid the darkness of the reigns of the worthless Charles II and his brother James! That was an evil period of national transition from the cruel despotism of the Stuarts towards constitutional government. Bruce recounts Lady Russell's birth in 1636, descendant on her mother's side of French Huguenots of high rank, and her early adoption of correct principles of freedom of religion and sympathy for others. Whereas the Oxford Dictionary of National Biography emphasizes the life-long attachment between Rachel Wriothesley and her sister Elizabeth as well as her half-sister by their father's second wife, another Elizabeth, Bruce follows a tradition of reading Lady Russell through her exemplary loving marriage. Bruce's biography passes quickly through an arranged marriage, at seventeen (Bruce says she was eighteen), to Lord Vaughan, the elder son of the Earl of Carbery, though this amicable union was an opportunity for a broad education at the Carbery estate in Wales. The Restoration in 1660 brought political power back to the loyal nobility, and hence more access to London for those in that party. In 1670 the high-ranked, wealthy, beautiful, and charming young widow married William Russell, handsome, ambitious younger son of the first Duke of Bedford. Collective biographies celebrate the union as a model of companionate marriage based on love and mutual understanding. "How tender, and yet how touching, are her letters, especially those of her earlier wedded life, sent to her husband during his occasional absences from home! Many of those earlier letters have been preserved. They are written in a negligent style and in homely phrase.... But they evince a warm interest in all his concerns, and are filled with items of home news, such as the health and amusements of their children; and little scraps of intelligence of the affairs of the day...; and ... also little bits of chit-chat about the fashionable world of that time; the gossips, frivolities, and follies of the court of the King...."
Bruce quotes from Lady Russell's letters: she prays, for example, that God "will continue to me all these joys," or give "strength to submit without murmuring to His wise arrangements.... He knows better than we, at what moment we have obtained and enjoyed enough here below. That which I earnestly implore of His compassion is, that no matter which of us may first depart, the other may not despair, as if without hope of finding his beloved one again." In another letter, she writes of the pleasure of reading Lord Russell's letters or writing to him, though words cannot express the passion she feels for him. Lady Russell confirms that her love "burned clearer and steadier, purer and brighter" as the years passed. Although romantic love is a constant theme, her letters also depict the lives of their three surviving children, and increasingly reveal Rachel as an informed and well-connected political strategist. This status quo must of course change, taking narrative shape: during "years of domestic happiness and peace," the "cloud" of crisis was building: after the "virtue and heroic spirit" of the Commonwealth, the decadence of Charles II had become intolerable; patriots saw him as "the pensioner of the French king," a secret papist; "Parliament was corrupt and servile, the standing army a burden and terror." Lady Russell encouraged her husband's consultations with leaders in France and England, but tried to guide him to be diplomatic in any opposition to the English court and ruling party. In Bruce's narrative, Lady Russell takes the more passive role of loving wife. Lord Hollis and Lord Russell were among those who began to seek an alternative for the country: "Was royal tyranny to have it all its own way? ...Was the nation to remain prostrate or become free? The nobility of Russell's mind, his lofty and honourable principles, and his glowing patriotism, made him shrink with repugnance from the very thought of calling in foreign aid," yet with others he hoped to revive the spirit that overcame Charles I. (In fact, there was glaring evidence that he had consulted with potential French allies on ways to resist Charles II.) If another Commonwealth was out of the question, they might found a constitutional monarchy, Bruce recounts. "...The entire State was at the feet of a debauched ruler and his profligate women. Russell resolved these weighty matters — alas! without consulting his noble wife." The patriots gambled on the success of a perilous plan to overthrow tyranny, but (Bruce insists) they had nothing to do with the plot to assassinate the King. "In an evil hour, Russell, Essex, Algernon Sidney, and Hampden admitted Lord Howard to their counsels,—a man of a fickle nature and malignant heart, a hasty conspirator, and a ready traitor. Howard... secretly went to the King, at the apartments of the Duchess of Portsmouth, and informed him of all.... Intelligence of the discovery was immediately conveyed to the conspirators. Lord Shaftesbury fled into Holland; Essex was placed in the Tower, where he speedily destroyed himself; Lord Russell was arrested, and taken before the Council. The King presided, keenly watching the noble prisoner, and already resolved that he should not escape, if it were possible to destroy him. The examination was long and perplexing, and at its close Russell was committed to the Tower. On entering that gloomy fortress—the dungeon home through weary years, and at last the grave of many a gallant heart—he said to his valet: 'They will have my life; the devil is unloosed. '[Note: See Eclectic Review, 1856.]" Eighteen days passed away between Lord Russell's committal to the Tower and his trial. During that period of suspense, Lady Russell was indefatigable in her endeavours to obtain all possible information relative to the trial, and to provide for her husband's defence. Prompted by the tenderest affection for her lord, she was desirous of being present at the trial, that she might support him by her sympathy, and assist him by taking notes of the evidence; and she writes to him to obtain his permission, saying, "Your friends, believing I can do you some service at your trial, I am extremely willing to try; my resolution will hold out—pray let yours. But it may be the Court will not let me; however, do you let me try. I think, however, to meet you at Richardson's, and then resolve. Your brother Ned will be with me." His consent was given; and when, on Friday, July 13, 1683, he was placed within the bar of the Old Bailey to undergo his trial for high treason, Lady Russell was close by him. In some versions, it is Lord Russell who on the spot requests his wife as clerk and advisor at the trial, but this scene at the trial was apparently pre-arranged by Lady Russell. Bruce relies on historical narratives of the scene of trial, contrasting the weak-willed presiding judge and the infamous prosecutors (Lord Macaulay described Jeffreys as insolent, irascible, and "'the most consummate bully ever known in the profession'"). "After a few objections as to some legal points had been raised by Russell and overruled by the court, he asked for the use of pen, ink, and paper, and for permission to use such papers as he had with him; and these requests being granted, he, wishing to have notes of the evidence taken, asked whether he might have somebody to write for him...." He was allowed to have a servant assist him, and to everyone's surprise he announced, "'My wife is here ready to do it.' 'If her ladyship will take the trouble, she can do so,' said the judge; and the thronging spectators could not refrain from expressions of sympathy and admiration, when the noble woman, calm, self-possessed, and majestic, seated herself by the side of the man she loved so tenderly and well, and whom she was so soon to lose. During the long and tedious trial, ever ready with wise suggestions, Lady Russell was at once her husband's secretary and counsellor; but neither able self-defence nor the more powerful eloquence of her tears could avert his impending doom. He was convicted and condemned, and warned to prepare for speedy death." Bruce makes a fairly dramatic narrative of the efforts, led by the active Lady Russell, to sway the king to pardon the prisoner. Appeals from "many of her friends, high in rank, and high in favour at Court," were followed by an offer of £100,000 from Lord Russell's father, but Charles refused money and ignored the public letter of appeal from the grieving father. "Indeed, it appears quite certain that the King was afraid of his condemned captive; for when Lord Dartmouth represented to him that some regard was due to Lord Southampton's daughter and her children,— that to pardon Lord Russell would lay an eternal obligation on a very great family, while the taking of his life would never be forgiven,—Charles replied, 'All that is as true as that, if I do not take his life, he will soon have mine.'" Lord Russell himself wrote letters of appeal and apology to both Charles and the Duke of York, disclaiming any intention of harming the king and begging for mercy and exile. Lady Russell asked for her uncle, the Marquis de Ruvigny, to come from the court of France to intervene, but Charles replied to the French ambassador, "'I am well convinced that the King my brother would not advise me to pardon a man who would have given me no quarter; I do not wish to prevent M. de Ruvigny from coming here, but my Lord Russell will be beheaded before he arrives. I owe this example both for my own safety and the good of my kingdom.'" Lady Russell next hoped to delay the execution, and Lady Ranelagh recommended that she petition the king in person; many classic narratives include the direct, weeping petition at the sovereign's feet to spare the child or husband from death: "she threw herself at his feet, and with streaming eyes and in a broken voice pleaded for her husband's life. The King was immoveable. Then she implored that, if his doom was irrevocably sealed, to grant him a short reprieve from Saturday to Monday; but even this slight favour was cruelly denied." As if concerned that Lord Russell comes across as unworthy of his wife's loyal campaign to save him, Bruce follows up with evidence that Russell was standing on principle. He refused to try to save himself by signing a declaration supporting the absolute authority of the sovereign, instead upholding the right of "a free nation" to "defend their religion and liberties," and Lady Russell supported his resolution, "for she agreed with him in the sentiment that the duty of submission to rulers is neither absolute nor unconditional." Bruce's narrative rarely follows Lady Russell's point of view, instead fixing its focus on the prison cell as observed by a surviving companion, Burnet, who published a memoir. Burnet testifies to the condemned man's admiration, love, and sympathy for the wife who would suffer at their last parting; the final scene would be the worst of it. "'... I am afraid she will hardly be able to bear it. The concern about preserving me fills her mind so now, that it in some measure supports her; but when that shall be over, I fear the quickness of her spirits will work all within her.' 'I never saw his heart so near failing him,' writes Burnet, 'as when he spake of her. Sometimes I saw a tear in his eye, and he would turn about, and presently change the discourse.'" Bruce's account continues to follow a kind of screenplay dictated by Burnet. Again in a classic topos of presentation of children, Lady Russell with their three children comes to the Tower on the eve of the execution,"that he might give them his blessing and take his last farewell of them. 'I saw him receive them,' says Burnet, 'with his ordinary serenity.' After conversing with them for some time, of their education and their future, he gave them his parting blessing, and dismissed them tenderly.'" Then husband and wife share a final supper, both suppressing their feelings. He remained "'cheerful, and spoke of the many illustrious men who had met death with calmness and fortitude. Then came the final parting: taking her by the hand, the condemned man said, "This flesh you now feel, in a few hours must be cold." He kissed her again and again, and yet again, and, as she turned to depart, he followed her with his eyes in silent agony. There had been no passionate cries and sobs, no bitter waitings of despair; their grief was too deep for tears.'" When his wife had disappeared, Lord Russell turned to Burnet, and said, "Now the bitterness of death is past;" adding at intervals, in his grief, "What a blessing she has been to me! God has shown me remarkable mercy in giving me such a wife — birth, fortune, great intellect, great piety, great love for me; it has been all that! And, above all, her conduct in this extremity! It is a great consolation to me to leave my children in the hands of such a mother: she has promised me to take care of herself on their account, and she will do it." While the affectionate wife was doubtless spending her night in tears, her noble husband was preparing himself for death. To Dr. Burnet he said, "What an immense change death must make in us! what new and marvellous scenes must open before our soul! I have heard it said of men who were born blind, that they were stricken with stupor when, after the cataract had fallen from their eyes, they were able to see; how great would this have been if the first object they had looked upon had been the rising sun!" At one o'clock he sank into a sound and refreshing sleep, from which his servant awoke him at four in the morning. He desired Burnet to convey to his wife his most affectionate remembrance, and to tell her that she would have a place in his last prayers. He then wound up his watch, saying "I have done with time; eternity is at hand." He was executed at Lincoln's Inn Fields on the morning of July 21, 1683, in the forty-fourth year of his age. To the very last moment he exhibited an unwavering calmness and fortitude, a Christian stedfastness and heroism, which, combined with the principles for which he died, has gathered so magnificent a lustre round his name. In this, the hour of her severest trial, Lady Russell doubtless never lacked the sympathy of her friends, which, with her repose in Divine Providence and her own noble nature, enabled her to bear up bravely beneath it all. It is not till two months after her lord's execution we gain any precise information concerning her state of mind, and this in a letter written to Dr. Fitzwilliam, an old and attached friend, in which she says: "I need not tell you, good Doctor, how little capable I have been of such an exercise as this... confused as my yet amazed mind is. But such men as you,... my friend, will, I know, bear with my weakness and compassionate my distress....You that knew us both, and how we lived, must allow I have just cause to bewail my loss. I know it is common to others to lose a friend; but to have lived with such a one, it may be questioned how few can glory in the like happiness, so, consequently, lament the like loss. Who can but shrink from such a blow! "Lord, let me understand the reason of these dark and wounding providences, that I sink not under the discouragement of my own thoughts! I know I have deserved my punishment, and will be silent under it; but yet secretly my heart mourns, too sadly, I fear, and cannot be comforted.... I want him to talk with, to walk with, to eat and sleep with. All these things are irksome to me. The day unwelcome, and the night so too; all company and meals I would avoid, if it might be: yet all this is, that I enjoy not the world in my own way.... When I see my children before me, I remember the pleasure he took in them: this makes my heart shrink. Can I regret his quitting a lesser good for a greater? Oh! if I did but stedfastly believe, I could not be dejected.... No; I most willingly forsake this world...in which I have no other business but to rid my soul of sin, secure by faith and a good conscience my eternal interests, with patience and courage bear my eminent misfortune, and ever hereafter be above the smiles and frowns of fortune." Later she responded to a letter of spiritual comfort sent to her anonymously by John Howe, concurring in the view that everlasting joy overrules the temporary loss of an earthly love. The heartfelt letters of grief and faith reveal one aspect of Lady Russell's character, but she in fact maintained a very active engagement with this world. She ensured that Lord Russell's scaffold speech, which she had helped to compose, was widely "circulated an hour after his death," defending his political position. Rumors grew that it was a false document, but "Lady Russell warmly contradicted this false charge in a letter addressed to the King himself; in which she informs him, that the things set down in her husband's speech were such as he had often talked over with her, and that the words written down were his, she could avow, as they were written by her desire. 'I do humbly beg your Majesty,' she concludes, 'would be so charitable as to believe that he, who in all his life was observed to act with the greatest clearness and sincerity, would not, at the point of death, do so disingenuous and false a thing as to deliver for his own what was not properly and expressly so.'" Soon after her husband's death she removed to Woburn, and there resolved personally to apply herself to the task of conducting the education of her children. And this resolution she carried out with her usual promptitude, energy, and perseverance; and it is pleasing to think that her labours were not in vain, but were crowned with success. She appears to have been her accomplished daughters' sole instructress. Her chief aim in training them was to make them good rather than great. To the Earl of Rochester she said, "I do assure your lordship I have much more care to make my children worthy to be great than to see them so. I will do what I can that they may deserve to be so, and then quietly wait what will follow." And this intention is fully borne out by the contents of a long letter addressed to her children, discovered and published in 1850. It is full of tenderness, wisdom, and earnest exhortations to follow the noble pathway of duty. Faithfully indeed did she fulfil her husband's last behest—she lived for her children, laboured for their highest benefit, and, patiently waiting until she should join her beloved one in the home of eternal peace, she was permitted to see her posterity honoured, virtuous, and esteemed by the entire English nation, who, enjoying that freedom to obtain which Russell died, forgot not, in their regard for his children, what was due to their noble father. Bruce paints with a soft brush, aided by Lady Russell's account of her motives, but clearly she was what we would call a player in political events and social alliances of the new regime. Her grief, Bruce concedes, did not "paralyze her actions; her forty years of widowhood were not passed in alienation from her kind" within a home circle. "Her letters amply prove that she never became neglectful of the duties incumbent upon her," including aid to the exiled Huguenots. More broadly, in her "long life she saw many changes. She saw the Stuarts hurled from the throne they had disgraced...; she saw the reign of William and Mary, and that of Anne; she saw the accession of the House of Hanover." By 1694, Lord Russell's father had been raised to a dukedom, making her son next in succession. She arranged stellar marriages for each of her children that confirmed their place in Whig power and as feme sole, she handled her own financial affairs and managed her estates with great success. Surviving the loss of two of her children, she finally expired at Southampton House, on the 29th September 1723, in the arms of the last, who was then Duchess of Devonshire. She died, beloved and honoured by all men, not alone for her great historic name, not alone for the sake of her illustrious husband, the martyr of freedom, but for her gentleness of soul, her sublime devotion to her husband's memory, and her religion pure and undefiled. England has been rich in heroic women, but surely none so commands our admiration, so kindles our veneration, so exalts us in thinking it was our nation she graced, as Rachel Wriothesley, wife of Lord William Russell. An interpretation focusing on the biography of Russell by Charles Bruce, The Book of Noble Englishwomen, 111-22, as well as Oxford Dictionary of National Biography. John Martin, ed., Letters of Rachel, Lady Russell. Philadelphia: Parry and M'Millan, 1854. Edited by John Martin, this text is the most extensive collection of the correspondence of Lady Rachel Russell. Includes a preface written by John Russell (Earl Russell) and retains Mary Berry's notes from the letters she previously edited that are republished by Martin in this collection. Full-text edition linked through Google Books. Lois G. Schwoerer, "Russell , Rachel, Lady Russell (bap. 1637, d. 1723)." Oxford Dictionary of National Biography. Ed. H. C. G. Matthew and Brian Harrison. Oxford: OUP, 2004. Online ed. Ed. Lawrence Goldman. Jan. 2008. Oxford Dictionary of National Biography entry on Lady Rachel Russell written by Lois G. Schwoerer (author of Lady Rachel Russell: "One of the Best of Women," 1988). Includes a detailed biography as well as a list of other sources and archive materials related to Lady Rachel Russell. 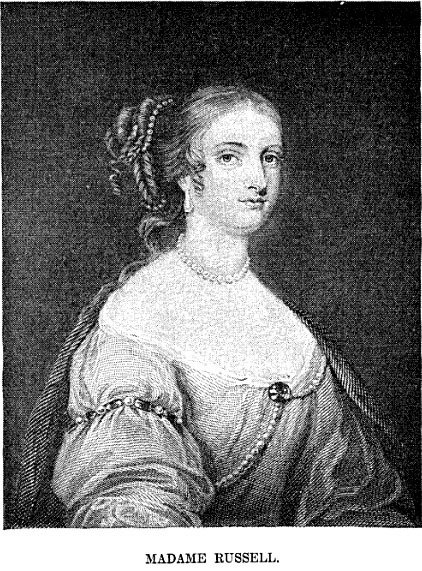 Mary Berry, ed., Some Account of the Life of Rachel Wriothesley, Lady Russell. London: Printed for Longman, Hurst, Rees, Orme, & Brown, 1819. Mary Berry edited this biography about Lady Rachel Russell, compiled from evidence extracted from her personal correspondence. The text provides copies of private letters she wrote to her husband, William Lord Russell. Full-text edition includes the editor's note. Linked through Google Books.